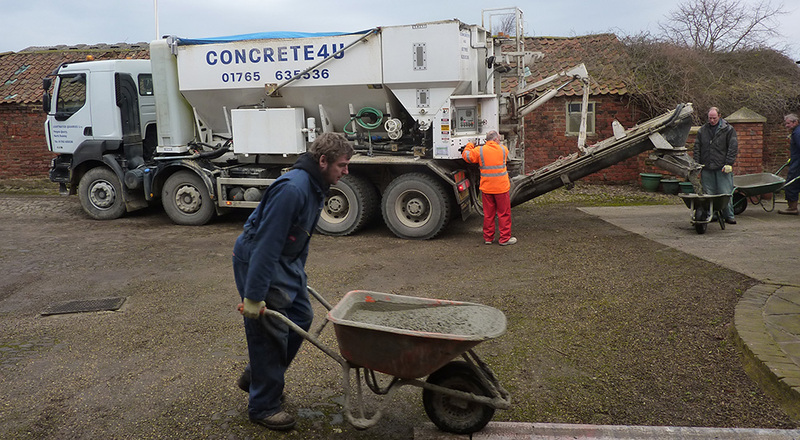 Look after yourself and your concrete. Wet concrete is caustic and will cause burns if left in contact with skin. Wear waterproof boots and gloves. Immediately wash with copious amounts of clean water. Clothing contaminated by wet concrete should be removed and the skin washed thoroughly. Irrigate immediately with copious amounts of clean water. Wash out mouth and drink plenty of water. Seek medical advice if a large amount is swallowed. As concrete can cause burns we recommend wearing protective clothing at all times. Keep your arms covered and do not go into the concrete unless you are wearing waterproof footwear such as wellington boots, if the concrete goes over the top then remove them immediately and wash your skin and your boots. We also recommend gloves and safety glasses. Concrete needs to cure without drying or freezing. The first 24 hours are critical to the longevity of the concrete. Keep the surface moist. This is important in bright sun or windy conditions. Concrete needs to expand and contract. Make an expansion joint every 4 metres by cutting part way through the slab with a disc saw. It is safe to walk on the concrete after 24 hours, but do not drive onto concrete until 4 weeks after laying. Protect it from frost for the first week. Please check that safe and adequate access has been provided, if you are unsure on how much access to allow, please see our truck measurements. Always ensure everyone coming into contact with the product use the correct safety equipment and protective clothing and footwear. Wet concrete is caustic and will cause burns if left in contact with skin. Wear waterproof boots and gloves. Wear eye protection. How long before the concrete goes hard? It takes approximately 1 – 2 hours for concrete to go hard however setting times are variable and can be dependent upon weather conditions as well as the type of concrete ordered. The concrete will require protective curing to prevent problems such as cracking, typically using a spray-on membrane or covering with plastic sheeting as soon as possible after placing. Alternatively spray a fine mist of water onto the surface. If the concrete dries out before it is cured it will be weak and the surface may crack from shrinkage. To minimise the risk of cracking due to expansion/shrinkage, make saw cuts through the concrete, if any dimension is longer than 4m. This will encourage controlled cracking instead of random cracking. Similarly around manholes and sharp corners, a saw cut will look better than a random crack. Make the cut as soon as the concrete is firm enough to allow the task to be undertaken. Even when the concrete feels hard to the touch, it has not achieved its full strength. Do not drive a vehicle onto concrete until 4 weeks after it has been laid. 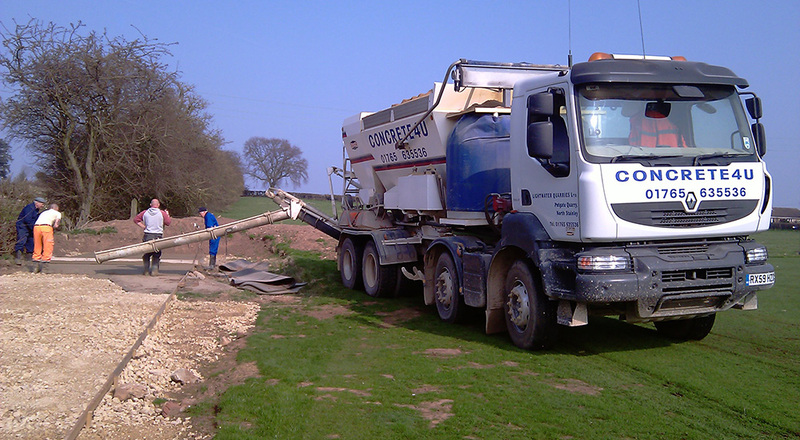 Do not build on concrete foundations for 2 days after it has been laid.